If you follow the directions below, your brisket will turn out great. You have to remember this: When it comes to cooking a brisket, the quality of meat that goes into the pit directly reflects the quality that comes out. If you start with crap will you end up with smoked crap. Try to find a good brisket that is at least a Choice grade. Angus beef briskets are also excellent usually turn out great when you follow the instructions below. 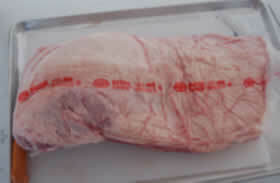 The picture shows an untrimmed, Prime Grade beef brisket weighing about 20 pounds. A brisket like this runs about 120.00 and is a realy quality cut of beef. You don't have to use a Prime Grade brisket, and you can turn out a great product with at least a Choice grade brisket. A beef brisket is composed of two parts, the flat and the point. The flat section is on the right in the picture. The Point is on the left, and it may have hard sections of fat in it. You will want to trim those out. The fat on top of the brisket is called the "fat cap" and should be white. The thickness of the fat cap varies, but ultimately you want it to be about 1/4 of an inch thick when you are done trimming it. Thicker is ok because you can trim it down. When purchasing a beef brisket, make sure the meat is a deep red color, which will represent freshness, and make sure it has plenty of fat incorporated throughout the meat and not just on top. The combination of the deep red color and the white fat of a brisket is called marbling, and it is the key to choosing a good brisket to BBQ. The marbling will resemble the same patterns you see when looking at a slab of marble. The fat looks like veins running throughout the meat. Since the brisket is such a thick cut of meat, the fat located throughout the meat will help to keep the beef brisket moist while smoking. Make sure the brisket has not been frozen. 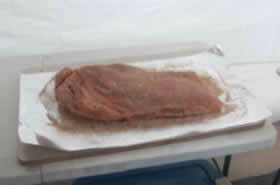 A frozen brisket may not display a deep red color, the fat may be darker instead of white, and the brisket will not turn out as tender and juicy as a fresh one after smoking it. You may have trouble finding a brisket that hasn't been frozen - just make sure it is fresh. When I choose a brisket, I lift the brisket in the middle to see how limber it is. I have seen briskets that are stiff as a board, and some that bend over each side of my hand. The stiff ones have probably been frozen or they can be tough. I have noticed that a stiff brisket may not be as tender as a limber brisket. Some people disagree with this test, but I am a firm believer because of the results I get. The weight of the brisket should be between 8 to 12 pounds. A larger brisket takes longer to cook, and the flat may become tougher because of the longer cooking time. The flat is thin and tends to cook faster. For this BBQ brisket recipe, I start my preparation process the night before I want to smoke the brisket. First, make sure you have plenty of work space and a clean area to prepare the brisket on. The brisket should have fat on it no more than 1/4 inch thick. Thicker fat will not allow the smoke to penetrate into the meat located under the fat. If the fat is too thick, trim it down until you reach the 1/4-inch thickness. Use a sharp knife and be careful. Remove any extrememly hard fat chunks too. After trimming the brisket, I rub the brisket down with a light of cooking oil. Massage the oil into every portion of the meat, including the fat, so that it covers the brisket nicely. The brisket should not be dripping, but you want a nice shiny coat all over the brisket. it should be just enough to help glue the rub to the brisket. I chose to use a rub on my briskets instead of a marinade because I have found that marinades penetrate only about 1/2 of an inch deep into the meat. You should use whichever method you like best, but I am going to describe the rub method. You can find many marinade and rub recipes on thesmokerking.com. After fully covering the brisket in oil, apply the rub on the brisket. When done correctly, the rub should form an evenly distributed layer of seasoning on the brisket. Use a little oil at a time so you don't create a huge mess, and apply the rub all over the brisket until it is fully covered. Wrap the brisket tightly in foil and place it in the refridgerator overnight. Take the brisket out of the refrigerator a little bit ahead of time before you want to put it on the smoker. You can place the brisket on the smoker when it is cold because a cold brisket will sweat which actually helps create the smoke ring. Place the brisket fat side up on the smoker. The fat will render while cooking - it basically melts and releases oils into the brisket to help keep it moist while cooking. I keep them on the smoker fat side up the whole time I am smoking it! I use a wood smoker with a firebox to provide indirect heat for outdoor cooking. I have found this method to be the best, but there are many more smoker styles available to choose from such as water smokers, propane smokers, and charcoal smokers that also do a great job. I use a combination of mesquite and hickory wood for smoking briskets because they provide a delicious smoke flavor, burn hotter so less wood is used, and that is how we do it in Texas. Many people do not use mesquite, which is fine, and I have included a section to provide you with information about the different types of wood that are good to use for smoking purposes. Check the internal temperature where the flat meets the point, throught the side of the brisket. 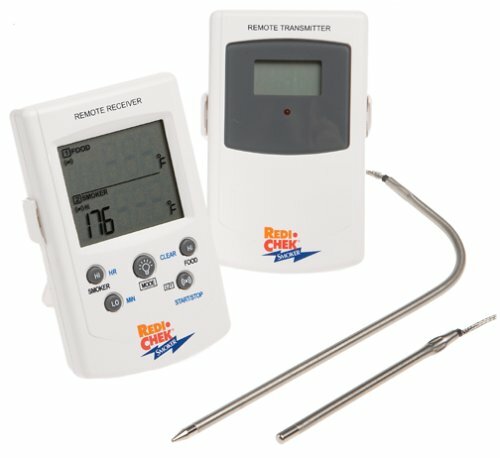 It is best to use a probe connected to a digital temperature meter, which remains in the brisket the whole time you are cooking so you don't put holes in it and drain the liquid. If you do not have one, use an instant read thermometer to check the temperature of the brisket. I use the Maverick, ET73. It has a remote unit that you can take in the house with you and monitor the internal temperature of the brisket while sitting on the couch. It also has a probe that measures the pit temperature so you don't have to rely on the temperature gauge on the smoker, which is probably wrong anyway. The newest model, the Maverick ET-735 Bluetooth 4.0 Wireless Digital Cooking Thermometer, Monitors 4 Probes Simultaneously , offers Bluetooth technology which lets you monitor the meat and pit temp from your phone, and it allows you to use up to four probes at one time! To achieve the best results, I cook the beef brisket at 225 degrees for about 1 hour and 15 minutes per pound. The time per pound is strictly a guide and cooking times will actually vary. Many variables affect cooking time and temperature such as how many times the smoker is opened, how close the brisket is to the fire box, the type of smoker you are using, the weight and thickness of the brisket, etc. Sticking to 225 degrees and 1 hour and 15 minutes puts you in the ballpark for a well cooked brisket. 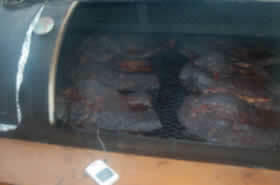 Many people believe that when the internal temperature of the brisket reaches 190 degrees, it is done. This is partially correct. When the internal temperature of the brisket is around 190, the brisket may or may not be done, and it really depends on the fat content inside it. If you are cooking the brisket at a temperature between 225 and 250 degrees, pull it off the pit and put it in a cooler for 2 hours when the internal temp is 203. The brisket will hold it's temperature very well in the cooler and it will continue to cook. This method if finishing your brisket will help you cook a very tender brisket. Before I put the brisket in a cooler, I usually let it sit on the counter for 10 minutes or so, while opening the foil a bit to let the steam out. This will help the brisket from looking like a roast when you pull it out of the cooler. A brisket will stall, or the temperature will stop increasing when the brisket reaches 165 degrees or so. At this point, evaporation occurs, and helps cool the temperature of the brisket. The stall can be very confusing and frustrating for someone hasn't had that much experience cooking briskets because the temperature stops increasing and it can take longer to finish the brisket than expected. To help combat this, wrap the brisket very tightly in foil when the internal temperature of the brisket reaches 165 degrees F. If there are no air pockets, the brisket won't steam, and the stall time is reduced signifigantly. Whe you wrap the brisket, use heavy foil wrapping it with two layers. Put it back on the pit fat side up and be careful not to tear the foil. The brisket will maintain this temperature for a while because the melting internal fat and outside cap helps cool it. Cooking through this point will help the brisket become more tender. Sometimes I use a mop sauce on brisket when I am smoking it. This can keep the outside of the brisket moist and tender. It is important to keep the lid closed while smoking the brisket to reduce heat loss and maintain a constant temperature, so when I use a mop, I baste the brisket about every 45 minutes to 1 hour. If you don't use a mop sauce, wrap the brisket in heavy foil at 165 Degrees F.
A great way to keep briskets moist while smoking them is to use 3/4 apple juice mixed with 1/4 cooking oil. It gives the brisket a great flavor, which is not overpowering, while keeping the brisket moist from the oil. An easy way to apply this mop is to put it in a spray bottle and simply spray it on the brisket. Remember this: More Mop = Less Bark. 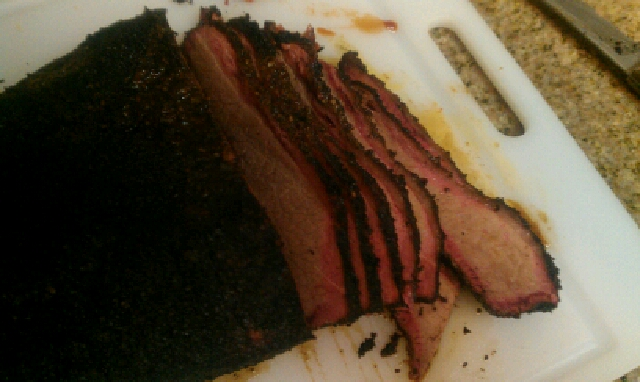 You can smoke the brisket the whole time without mopping it and it will turn out just fine. ALWAYS slice the brisket against the grain. Doing this will make the cuts of meet very tender. To do this, remove some fat from the top of the brisket to see the direction of the grain in the meat, and slice against it. I separate the point from the flat before I slice the brisket because the grain generally runs the same direction in the flat, and it is easier to see when it is separated. The point is a little harder to correctly slice because the grain in it runs in different directions. After some practice at carving the brisket, you will know which direction the grain runs, and you will find it much easier. Note: Slicing a brisket is much easier if you have the perfect slicing knife! I always use a Victorinox 12-Inch Granton Edge Slicing Knife with Fibrox Handle when slicing briskets at home and especially during competitions, when I need to achieve perfect slices. Add your favorite barbeque sauce.